Travel smarter — read it before you go! Rick Steves' Europe 101 doesn't just tell you what happened way back when, but more importantly, why it matters and where to see the most vivid examples. Written in a breezy, humorous style, Europe 101 will actually get you excited about art and history — not feeling like you just ate an encyclopedia. Dimensions: 8 ½" x 5 ½" x ¾"
Let's face it: Museums can ruin a perfectly good vacation. But with Europe 101, you can open Europe's treasure chest of great sights and watch them come alive. After more than three decades of travel, Rick and Gene have distilled what you need to know (and no more!) in order to fully appreciate Europe's sights and culture. 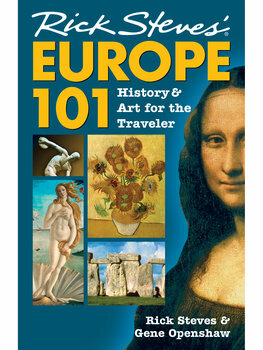 Written for smart people who slept through their history and art history classes, Europe 101 tells the story of Europe — from the pyramids to Picasso — illustrated with hundreds of color photos, featuring Europe's most important art, architecture, places, and people. The New York Times says, "Europe 101 is a diligent and thorough review of the subject that steers visitors in the right directions." The Boston Globe calls it a "humorous and historical perspective covering a mere 5,000 years of Western civilization." The Chicago Tribune calls the newest edition "fun, informative, entertaining and practical."